The pack doesn’t take its normal daytime nap when Geoffrey is home. Instead, today was mostly constant in/out/up/down. For Aurora, of course, the motivation for all movement was PLAY! I went to church and by the time I came home and did some stuff it was late, so no visitors today. We did discover that Aurora doesn’t seem to want lunch anymore. She’s enthusiastic about breakfast and dinner, nearly cleaning a big bowl of wet puppy food and kibble. Aurora also has discovered that she can use the human’s fixation on bodily functions to get trips outside whenever she wants. She runs to the very back of the bricks and often to the way back. She smells and does taste testing for everything! Fortunately we removed dangerous plants — like foxglove — when we had our first litter in 1995. Now we just have to keep patroling for foreign objects and interloping predators. We wound up the afternoon posing for a family picture. Sorry that we didn’t have someone at the camera to get the girls’ attention… especially Apex’s. But, here’s what the Ozdachs looked like this afternoon. 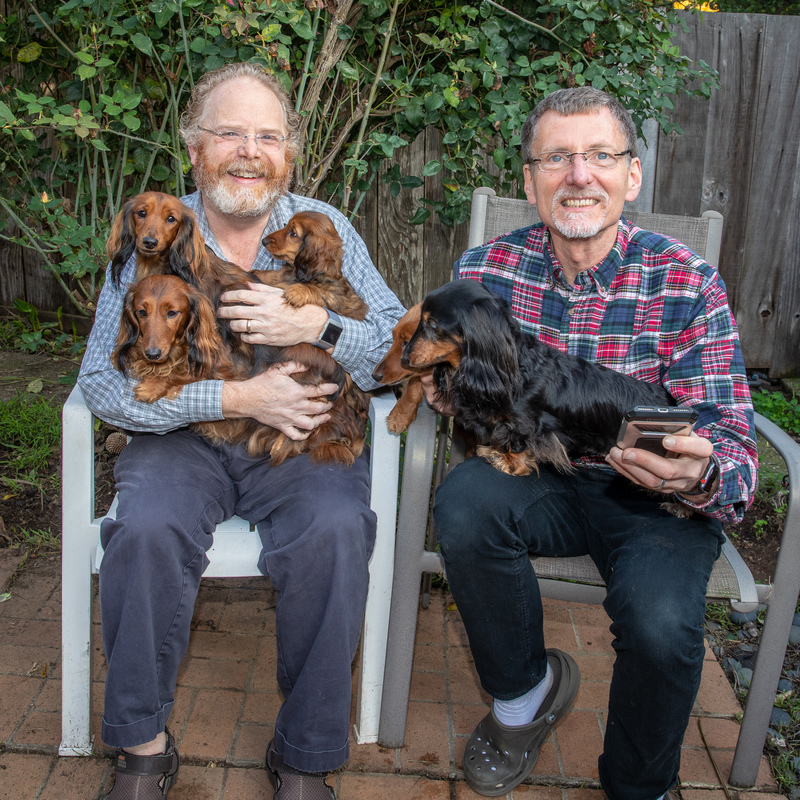 This entry was posted in dachshunds and tagged Apex, Aurora, backyard, dachshunds, Galen, Geoffrey, puppies2018, SeQueL, Zenith, zenith puppies. Bookmark the permalink.